New feature just landed! 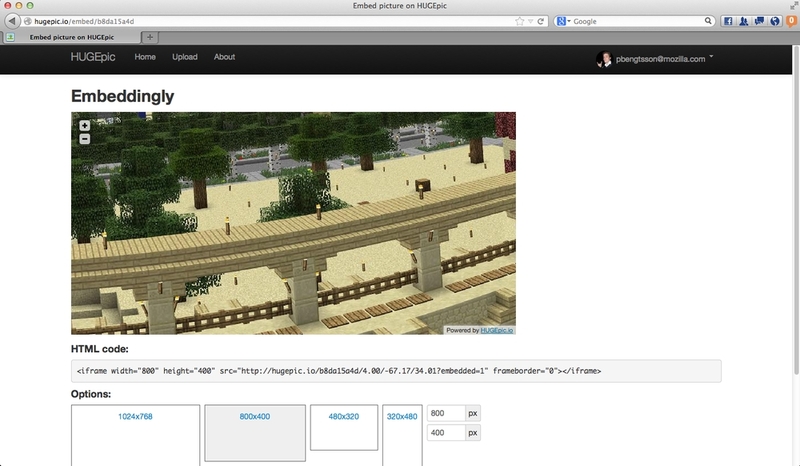 Now you can embed pictures from HUGEpic so it can be on your own site. See example below. So to do this I opted for the simplest solution possible. It's basically just an iframe to the regular URL but with ?embedded=1 set. What this does is that it removes all buttons except the zoom navigation buttons. There are some other configurable things like like hide_download_counter=1|0 and hide_annotations=1|0. At the moment there's no UI to change these options but at least the functionality is there in case somebody wants it. To try it, click on any picture then click the little "Permalink" icon (the icon that looks like a chain link) in the upper right hand corner and follow the link that appears. FYI, the inertial scrolling only works for me some of the time. Is there a posibility to keep you from panning out of the picture? So you never get to the grey area or to the seam of the repetition? For instance this pic is a nice hugeness example^ but it doesn't repeat seamlessly. I can imagine patterns that repeat well in height and width but also just panoramas that repeat horizontally. It would be nice to have control over that. Also a 3D mapped mode would be cool!